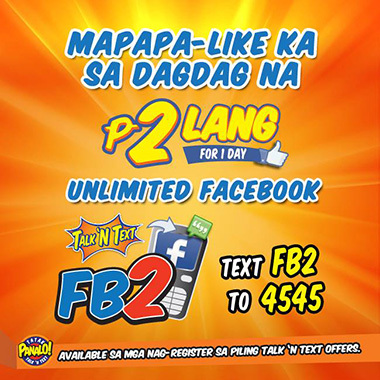 Talk ‘N Text subscribers have more reason to stay connected with your family and friends with Talk N Text Unlimited Facebook FB2 Promo. Just register to selected Talk ‘N Text Offers and you’ll get unlimited Facebook subscription for 1 day! For just an additional P2 pesos you can now have unlimited access to the latest happenings on Facebook. More likes, share and comments to do. How to Register to Smart Prepaid Unlimited Facebook FB2? Enjoy your Unlimited Facebook browsing for 1 day! If you want to learn more about Talk N Text Unli FB2, simply visit to Talk N Text website (www.talkntext.com.ph) or you can visit Talk ‘N Text Communications Facebook page for the latest updates.